I just figured out a very obvious but probably not popular mindhack for getting through the week on the slow-carb diet. I love ice cream. Every night before going to sleep I love to have a big bowl of the stuff. Since I am glucose sensitive, the bowl usually put me in a nice sugar-coma… which was no big deal because it was bed time. I inherited this learned behavior from my father who in turn learned the behavior from his father. The net result for myself and my grandfather was a nice layer of fat in my mid-section. Not-Good. What I discovered was a mindhack to break out of the cycle of self-destruction. Rid your home of everything that you crave using your binge day. This will likely take several weeks, so have faith and patience. On binge day, eat out at some place that has that which you crave. 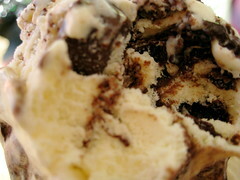 For me, simply having ice cream after a nice meal was all that was needed. Pray for the strength and self-discipline to get past the cravings. Pray for forgiveness for not being a good steward of the body the Lord has given you. And pray to give God thanks for the incredible richness of life you have been given. See? Wasn’t that easy? If items aren’t in your home, you can’t cheat… except for that stop for gas where you go in to pay and have to pass the ice-cream cooler on the way to the cash register. Curse you, 7-Eleven!! !